Former probation officer Mari Hannah has built a fine crime writing reputation on the back of her tales set in the north of England starring Detective Chief Inspector Kate Daniels - in fact last year she won the prestigious CWA Dagger in the Library, a prize for a crime writer's body of work rather than a particular single book. Here, Hannah veers from her popular and acclaimed Kate Daniels series to deliver a hard-hitting standalone thriller (that has itself sparked a new series). And she does it with considerable aplomb. THE SILENT ROOM kicks into high gear early, as a prison van carrying a disgraced cop is hijacked by armed men on the way to Durham Prison. But has former Special Branch officer DI Jack Fenwick been broken out by the villains he was allegedly working with, or has the former top cop been actually been kidnapped? Is Fenwick a danger, or in danger? Fenwick's protégé and friend DS Matthew Ryan has been suspended and is under surveillance in the wake of his boss’s arrest on corruption charges then subsequent break-out/abduction, but still believes Fenwick is one of the good guys – a sentiment few of his colleagues share. As a manhunt gathers steam and an official investigation sputters, Ryan goes off-grid with a collection of unlikely allies to try to dig out the truth, including retired Special Branch cop Grace Ellis and her shady contact Frank Newman. Hannah delivers pace and excitement in spades with THE SILENT ROOM, a ripsnorter of a thriller where most of the main cast move among shades of grey. She brings the characters to life as conflicted and multi-layered human beings, rather than just moving pieces for the action-packed storyline. 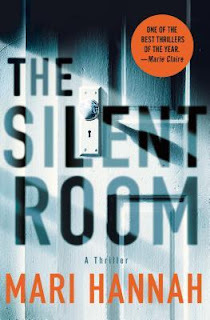 THE SILENT ROOM is almost like a spy thriller blended with a cop story, with all the intrigue and looming threat of covert operations and can-we-really-trust-them allies/enemies seasoning in the investigation of who it was that broke Fenwick out. There’s a lot to like about this tale which will have you whirring the pages while caring about the people involved. A very good read from a very good crime writer. Note: THE SILENT ROOM was originally published in the UK and Commonwealth in 2015, but has now been released by Minotaur Books in January 2018. For UK readers there is now a second DS Matt Ryan tale, THE DEATH MESSENGER, published in November 2017.